The stress of the ride was playing with my mind. 100 km= Over 4 hours of riding. 5 am – 9.15 am at the least. The distance and negotiating traffic on my cleats (just to put it out there- my safe dismount rate off the bike is 50%!) were my primary concerns. So, I woke up before the alarm at the unearthly hour of 3.30 am and was twiddling my thumbs for a while. 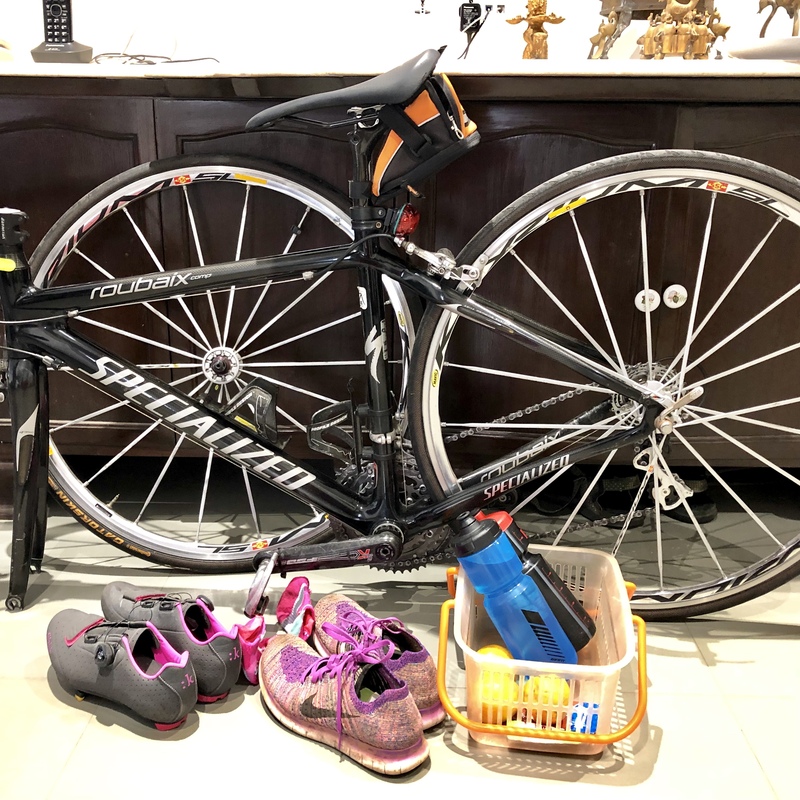 Finally, shaking off the lethargy and getting my act together, I ate the bowl of oats, gathered my stuff and headed out.The car was loaded with the bike, bottles, shoes, blah blah from the night before and I only had my banana and helmet to be carried with me. 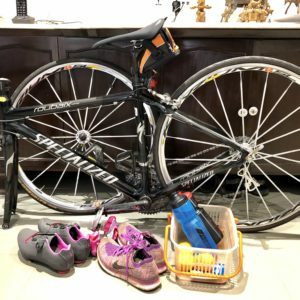 You know, the one thing about this Triathloning business, is that EVERYTHING is a production. Nothing is straight forward like just put on your shoes and run! On reaching NCPA, my car was the first to be parked at 4.45 am. I felt like that front bencher! With butterflies in my stomach, I took out the bike and started the setup. I had a bad feeling…my brakes felt tight and the front wheel was not sitting. I have done this several times before and its always worked. My fingers were shaky. Kapil helped set the wobbly bike right. With that done, I wrapped up everything to start the ride (more like expedition!) and I could not find the car keys. I was losing my mind. I looked for them all over the car, front seat, on the floor, in the boot, and guess where they were…Omkar found them in the ignition. Man- I felt like a fool. As we started riding, Vikas points out that my cleats were loose! And I broke out in sweat. It was all falling apart. I mumbled something about just going back home and just riding on that blasted trainer, but then Russa said just take a deep breath and then we all started together. 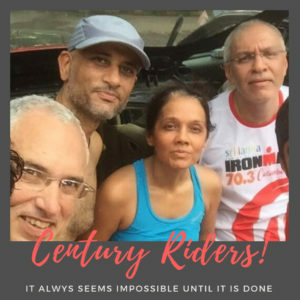 We rode as a pack or the first 15 minutes and then all of us found our paces, except for Kapil, who stayed with me. It was a good day to be out. The morning was cool and it was yet dark, with not much activity. It was too early for runners and there was only one group of teenagers who were completing their Friday night revelry with a game of pavement football! It was a really comfortable chatty ride. At most points, it felt effortless and we were in the moment. This was not a day to look at how much time had passed. I had made peace with the distance, so it would end when it would end. We took our gels, bars, and kept ourselves well fed. Thumbs up and nods were exchanged as we acknowledged each other’s effort while crossing on opposite sides of the road. This was the first time that all four of us would be doing this distance! After about three and half hours, at the traffic light at Mafatlal Club, there was a pile up and I was forced to stop. As I un-cleated my right foot and stepped on the ground to balance myself, something happened(?) and I tipped over to the left side and gently fell! Kapil calls it “Slow motion tip over”! As a result, my chain came off. So promptly I turn the bike over and tried to fix it. But something had twisted. To my good luck, Vikas came by right then, helped me fix the chain. Then Kapil came back to look for me. I am ever so grateful for the both of them! With black, greasy hands, I climbed back on and rode the fastest 20 kilometres of the entire 100km. Kapil and I climbed the hill too, for the seventh time that morning, and cruised to the finish (albeit in full traffic- yuckl). Not wasting a minute, I quickly changed into my running shoes and off I went. The others had started running long before me. Not realising what pace I was at, after 12 minutes I realised that I was too fast. Also, the stress of biking in traffic for the last 45 minutes caught up with me and I started losing it in my head. Then came the slowest Kilometre as I walked twice. I took deep breaths, detached myself from the bike ride and focussed on the task at hand which was to run 40 minutes. ONLY. Slowly I picked up and got my rhythm back and finished the 38 odd minutes at a not-so-bad pace. As I sprinted to a finish at NCPA, I bent over to catch my breath and I felt tears well up inside me as I realised what I just completed. And then a sense of joy. I went to the car and high fived the boys. Sweat and adrenaline filled the air. Joy and pain reflected all around in the sunshine. And I grateful to my boys, who are with me on this the journey toward my dream. Nice memento of a memorable ride.